Hi crafters its Naomi here with a fun project for you all to try - Candle Stamping. You will not believe how easy this is to do and I guarantee once you start you will become addicted and you will have gorgeous stamped candles all over the house. Step 2. Turn image over and colour with paints. Step 3. Carefully tear around your image leaving a small border. I find tearing gives a much nicer result as the edges blend into the wax better and don't leave any defined edges. Step 4. Tear a piece of waxed paper long enough to wrap around the candle and hold onto so you can heat the candle without burning yourself. Place your image paint side to the candle and tightly wrap the waxed paper around the candle. Step 5. Using your heat gun gently heat the wax using a circular motion so you aren't concentrating the heat on one area causing the wax to melt unevenly. You will start to see the image embedding into the wax and start to go shiny, once the whole image is shiny and there is a small film of wax on the outside of the paper the image is now transferred to the candle, don't continue to apply heat as you will end up with an uneven surface on your candle. Step 6. Carefully remove the wax wrap and your candle is complete. 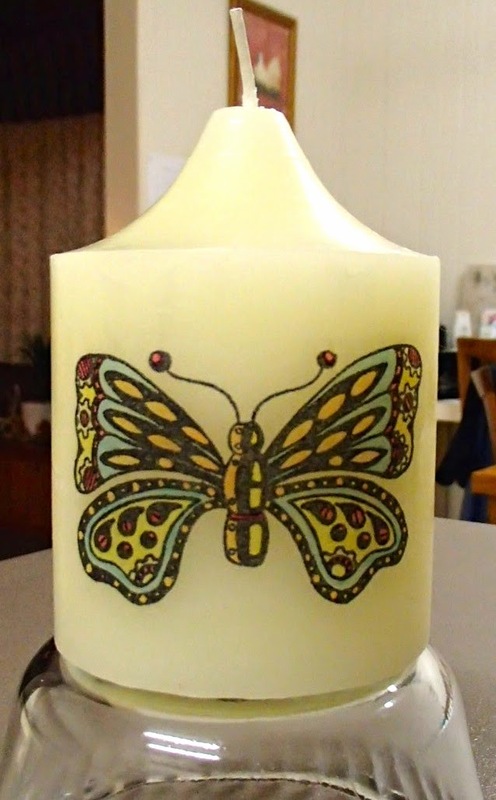 Here are a couple of other candles I have made using some of my favourite JOFY stamps. I added some washi tape to the bottom of this one to give it a little lift, you could also add some ribbon or twine. I hope you like this tutorial and would love to see some of your stamped candles so leave a link in the comments so I can come and cheek out your work. They look awesome Naomi....great idea for a pressie! Geraldine's First Sneak Peak - Exciting times ahead !